It wasn’t the China assignment he’d wanted, but to the newly ordained Father Albert Braun, OFM, the Mescalero Apache Reservation in New Mexico seemed just as foreign and isolated. Arriving by horse-drawn buggy in August 1916, he found the tiny adobe church cracked and crumbling and the two-room rectory a misery of bedbugs. Mescalero was little but a teepee-dotted clearing. Few of his parishioners spoke English, and Father Al knew no Apache. His charges were scattered over 720 square miles of rugged country, most of it accessible only by horseback. He dismissed these difficulties with his usual insouciance. “Insignificant!” he roared heartily, and went to work. Soap and sulphur banished the bedbugs. With a good horse and a tough backside he attacked the wilderness. Tribal member Eric Tortilla soon was riding with him as guide, interpreter and friend. With Eric he camped with Apaches, ate Apache food and absorbed their culture around their campfires. Learning as he taught, he recognized their deep spirituality: in their own way they worshiped the same Creator he did! When others sought to ban the “pagan” puberty rite – a cornerstone of Apache culture – Father Al took then Bishop Schuler to a ceremony, explained and interpreted everything, won the bishop’s sanction and saved the ancient tradition. His respect for the Apaches’ culture deepened theirs for his Church. A strong love ripened between the Mescaleros and their young priest. Church attendance swelled, and Father Al began to envision a larger church. But by April 1917 America was at war, and the intensely patriotic priest volunteered for chaplain duty. Despite his superior’s initially castigating him as an “adventurer” seeking to “enjoy the wild life of the Army,” he persisted, and in August 1918 he sailed for France. During the bloody Meuse-Argonne offensive he went unauthorized “over the top” with the first assault at St. Mihiel. When wounded he refused to leave the field. “This is where I’m needed,” he snapped, and he continued to anoint the dying and bandage the wounded. He returned with a Purple Heart, a Silver Star and a golden dream of “a huge stone church that would last for centuries” and “light their lives forever.” He requested permission to replace the old deteriorating structure. The reply astounded him: Permission denied. “Insignificant!” he barked – if the road’s blocked, find a detour. He quietly began to fill the cracked adobe walls with gunpowder. Soon a mysterious explosion gutted the church. The Indian superintendent condemned the building, and Father Al got his permission – but still no funds. He shrugged. He had $100 in leftover Army pay, a hard head, and a dream. He solicited railroad passes, journeyed to Philadelphia and approached noted architect William Stanton. Captivated by this priest who would build a Gothic church with bare hands and no money, Stanton drew the blueprints at no charge, adapting medieval plans designed for hand labor. Father Al donned overalls and went to work. His old friend, stonemason Tony Leyva, came from California and worked for only bed and board until his death in 1936. With a few Apaches and some primitive tools they dug the foundation, quarried and hauled huge stones, built kilns, burned limestone and mixed mortar. In 1920 they laid the cornerstone. Though reassigned in 1924, Father Al returned three years later, and work recommenced. Brother Salesius Kraft, OFM, a German ex-artilleryman, now joined the crew, working until he was tragically crushed beneath a huge building stone. He is buried just outside the church. Many other duties also claimed Father Al’s time and energy. He covered miles to marry, bury, baptize and teach his far-flung flock. Believing the Apaches must learn to cope with the encroaching world or be obliterated, he initiated an “outing system” for educating Apache girls in Catholic homes off the reservation. Many Mescaleros lived miles from the church. Receiving a check from the East for a chapel in some remote place, Father Al went to Shanta Boy, a Mescalero who held the isolated Three Rivers ranchland. Could he build the chapel on this land? What would it be called? Shanta Boy asked. The donors had stipulated it be named in honor of their parents. “Saint Patrick –“ Father Al began. “No. Ugly name. Can’t build here.” Grinning, Father Al switched quickly to the Spanish version. “How about San Patricio?” Shanta Boy smiled and nodded. That was a good name! The chapel still stands. During the late twenties Father Al found himself embroiled in the Mexican Revolution. When the anti-clerical Obrégon and Calles regimes outlawed all clergy and began confiscating church property, Father Al volunteered to cross the border incognito, carry money and messages to priests driven underground, and “purchase” Franciscan property to save it from seizure. He and Father Dave Kirgan, disguised as businessmen tourists, made three dangerous trips into Mexico, worked covertly, accomplished their mission – and relished every cloak-sans-dagger minute. Long before the church was completed, it was in use. Memories still remain of midnight Masses around Christmas bonfires in the roofless shell, followed by traditional Apache dances. In 1939, though still lacking window glass and light fixtures, St. Joseph’s was dedicated. Then the windows were boarded, not to be completed until after World Was II. 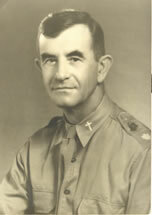 Father Al had volunteered for duty in the Philippines, where most expected the attack to come. It did. Assigned to the 92nd Coast Artillery on Corregidor, he also crossed regularly to Bataan to serve “his boys” of New Mexico’s National Guard regiment, the famous 200th Coast Artillery, during their historic stand against impossible odds. For his unwavering valor throughout the doomed defense, the grateful 200th named him their honorary chaplain. Inevitably Bataan fell, and then Corregidor. Enduring 3 ½ years of filth, brutality, disease and starvation in Japanese POW camps, Father Al never faltered. He risked torture and death, helping to smuggle desperately needed medicines through the barbed wire for the sick and dying. When stricken himself, he gave his scant share to another. With courage, humor, and faith he kept hope alive. Intervening for his men, he took many a beating. He nursed the dying and buried the dead. Defying the guards, he served Mass in secret until, when finally allowed to hold services openly, he built a small altar. One day he was approached by a fellow prisoner who – with stealth, daring and stolen parts – had built a radio to track the American advance and be ready when they arrived. He needed a power source: could he use the small light over the altar? “Certainly. But –“ and Father Al’s eyes twinkled – “if any Japs come by, you’d better be praying like hell!” As MacArthur’s forces neared, the Japanese began shipping prisoners north to prevent their liberation and to work them in Japanese war industry. In the suffocating hold of an infamous “hell ship,” Father Al led a thousand men in prayer and song to sustain hope and sanity. After war’s end and liberation, the friar returned to Mescalero, shattered in health but joyful in spirit, determined to finish St. Joseph’s. He plunged into work, and on Veteran’s Day 1945 he dedicated the magnificent church to his fellow veterans of both World Wars who had not returned. When notified that he was to receive a second Silver Star and the Legion of Merit “for gallantry in action,” he requested the presentation be held among his beloved Apaches. Some 1,500 attended – churchmen, fellow veterans, Apaches, a bevy of top Army brass – and the Fort Bliss band. The tribe hosted an enormous barbeque. And Father Al, despite a broken arm (“Insignificant!”), snapped a crisp salute. He hung the certificates too high to read (“otherwise I might get a swelled head”). More treasured by him was a small booklet patched together from scraps of paper: Christmas greetings from his fellow POWs to their beloved chaplain. After a round in Army hospitals, a tour of duty in Hawaii and a stint in Okinawa for an atom-bomb test, he retired from the Army in 1949. But increasingly ill health necessitated reassignment to ostensibly lighter duty in Phoenix. Still unable to stand idleness, he again began to build, this time in a poor Hispanic barrio – three chapels, a school and the Sacred Heart church, all with the participation of the people who, by giving “a dollar a brick” as they could, and working beside him in construction, built their lives into the parish. As with the Apaches, he lived close to his people, reaped their love, expanded the faith and changed their lives. He secured sidewalks, paving, gas and sewers for the barrio. He broke up a sizable drug ring. Casing the bars, he shamed men home. He obtained the release of many arrested for petty misdemeanors, grumbling repeatedly that “they can’t support their families in jail.” Crime in the barrio decreased, and parish life grew. Even in his last years, in a nursing home run by the Little Sisters of the Poor – minus one leg, partially deaf, and dying of cancer – he refused to stop. He was a familiar sight racing about the streets in his wheelchair, which sometimes overturned as he jumped it over curbs. But once set right, he was tearing off again, seeking couples who needed marrying, children who needed baptizing, strangers who needed religious instruction. The “last of the frontier priests,” he was buried as he had wished, among his beloved Mescaleros, close by the altar in St. Joseph’s. Hundreds attended the funeral Mass. Apaches spoke eulogies in their own tongue. “There wasn’t a dry eye,” recalls one Bataan veteran. Locally described as the “Apache cathedral,” St. Joseph’s has suffered from time, weather and truck traffic on Highway 70, which now cuts through Mescalero. Under the expert direction of Brother Peter Boegel, OFM, a skilled engineer, extensive restoration is proceeding. Apaches and surrounding neighbors have pitched into make it a true community effort, and veterans’ groups have aided in fundraising. Above all, individual donations are supporting the project, which continues as funds allow.